Twitter is an awesome resource for school librarians and teachers. However, no matter how much I encouraged my fellow teachers, some of them just didn't care for the fast-moving conversations in the Twitter stream. They like the resources but didn't connect with their peers since they need to monitor the hashtags regularly or participate in Twitter chats which interfere with their family time in the evenings. Now in the past year, educator Facebook groups have exploded in that social platform known for grandmothers sharing pics of their families, high school reunions, and way too much social drama over politics. What I have learned is that for many teachers, Facebook is a comfortable way to connect with groups of like interests. The Future Ready Librarians group led the way for school librarians connecting with over 15,644 members. Breakout EDU and the SeeSaw Teachers group are even larger with over 25,000 plus teachers with school librarians embedded in the conversations. Facebook Groups are different from Facebook Pages. Many of my favorite ed tech bloggers have a strong presence on Facebook such as Richard Byrne's Free Technology for Teachers. Of course, he posts on Twitter but it is super simple to "like" his page, scan over his posts, and save the link. Later, I can click on the ones I'd like to read further and share them on Pinterest or a Padlet. 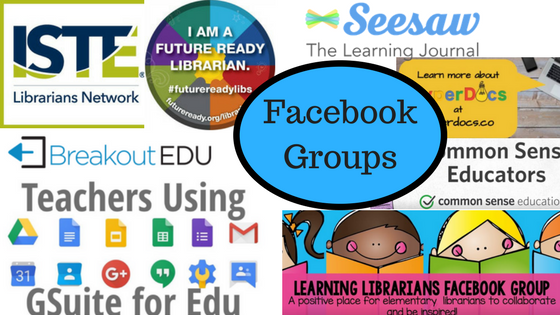 Check out the Google Sheet below for the top Facebook groups I enjoy curating ideas and resources. The spreadsheet includes group descriptions, links, and more. If a group is "closed", you will have to click on the Join button and follow the directions for that particular group. Many of the closed groups use this method to eliminate sellers from scamming their members. These groups have a team of administrators who monitor the conversations and comments. For school librarians, I would recommend the Future Ready Librarians, School Librarians Workshop, and Learning Librarians (elementary librarians). If you have another favorite Facebook Group, just leave it in a comments below. Want to make a copy that you can print in a PDF format? 1. Sign in to your Google Drive account. 2. Click on this "Make a Copy" link. 3. You will now have a copy of the Google Sheet in your Google Drive. 4. Click on File>Download as>PDF document (.pdf).